What is it Like for a Comedy Stage Hypnotist at a Fair? Join the Incredible Hypnotist as he shares behind the scene footage at the Silver Dollar Fair. If you’re interested in either becoming a comedy stage hypnotist at a fair or are a fan that is curious to see what goes on behind the scenes, you’ve found the right article. Many people don’t know how difficult it is to adopt a career that requires constant travel. Stage hypnotists that perform at fairs and festivals have a fantastic time traveling the country and experiencing new and exciting things. That being said, the life of a service-road warrior isn’t for everyone. The Incredible Hypnotist, Richard Barker, pulls back the hypnotic curtain and vlogs his recent hypnosis show performances at the Silver Dollar Fair in Chico, California. You will find this “Day in the Life of a Stage Hypnotist” video both entertaining and informative. Many stage hypnotists don’t share all the grit with their audiences; Barker wants you to see everything that goes into a comedy hypnosis show at a fairground or festival. When you’re a traveling stage hypnotist, waking up at 3:30 am to catch a flight is a usual occurrence. One week you’re in New York City and the next, you’ve got to catch an early morning flight from the East Coast to the West Coast. This particular day, the Incredible Hypnotist had to catch a flight from Orlando, Florida to San Francisco, California. Having to perform his hypnosis shows at the Silver Dollar Fair in Chico, Barker and his crew immediately claim their rental car at the San Francisco airport. Fighting the traffic of the congested highways of California, they set out and continue their journey. Watch the video to laugh out loud as they are on the cusp of losing their sanity after 24-hours of traveling; complete with flight delays and rush hour traffic. Have plenty of time to start bringing in your show gear and wardrobe. Now that all T’s are crossed and all I’s dotted, the comedy stage hypnosis shows can began without a hitch. Watch the behind the scenes video to see that a hypnotist has more to handle than just entertaining. You’ll have to make plans to actively sell merchandise before and after the show. If you perform a stellar hypnosis show, your fans will want a meet and greet to discuss their experience firsthand with you. You have to prepare to setup and breakdown your stage props. As you will see in the video, a lot goes into making sure that you give the fair-goers a fantastic show. While on stage performing, a hypnotist has to be able to gauge their audience and their volunteers with exact precision. When done properly, a comedy hypnosis show will leave the hypnotist mentally exhausted. You have to choose the right hypnotized stage volunteers for your bits and quickly ascertain their personalities. Your memory has to be on point so that you can multi-task the varying show routines and callbacks to keep the show moving forward. After the shows are over, a professional hypnotist with a successful business will keep working. At the end of a long and draining day, you will still see Barker up late at night working hard on the administrative and marketing aspects of his business. His advice for all hypnotists that desire a life on the road is to learn how to manage your time wisely. Another useful and helpful take away in this video for fair performers is the importance of getting to know your sound engineers and technicians. While interviewing Henry Hampton and Stan Glenstock, Barker points out that getting to know your stage crew is vital to a successful week of shows. Hampton and Glenstock spill the beans on their experiences as sound engineers for the Silver Dollar Fair over the past 34 years. After hearing some wise tips from the sound guys, Barker adds, “And this is why you make friends with the sound guys; they’re worth their weight in gold and are there to make sure that everything runs smoothly and you sound great. Get to know the other performers, vendors and staff at any fair or festival you perform at. Building relationships like these are key when it comes to getting an invite back to the fair. As your comedy hypnosis performances progress, expect a great deal of fatigue to set in. As stated before, being a comedy stage hypnotist requires great stamina and mental concentration. Prepare yourself to combat these bouts of fatigue and strain so you can continue to perform outstanding shows all week long. You will also need to prepare yourself for unexpected disturbances. As seen in the video, Barker’s entire hotel got a wake-up call at 3 am by four fire engine trucks. The entire hotel was evacuated and hard working Richard was forced to leave the comforts of his bed to stand in the hotel parking lot until the building was cleared. While on the road, these things happen and are out of your control. Expect the unexpected and you will be able to bounce back swiftly. If you’re seeking a career as a stage hypnotist know that the career demands constant stamina, focus and organization. Watch the full hypnosis behind the scenes video to step into the life of a professional stage hypnotist at a fair. If you enjoy the video, be sure to subscribe to our YouTube channel and be alerted whenever we post a new hypnosis video. Please don’t hesitate to reach out with any questions. For those of you that are not familiar with the Silver Dollar Fair, we recommend heading to their website to learn about the history. Chico County has brought their annual fair and rodeo to California for the past 100+ years. The fair administration strives to gather the community for this time-honored tradition to celebrate the rich history and developing-agriculture of the region. Complete with live entertainment, rides, community events, music, food and games; the Silver Dollar Fair has something fun for each member of your family. Your conscious, everyday waking state represents less than 10% of your total brain function. If you enjoyed this behind the scenes look at a stage hypnotist’s fair gig, check out the hilarious hypnosis video compilation next. 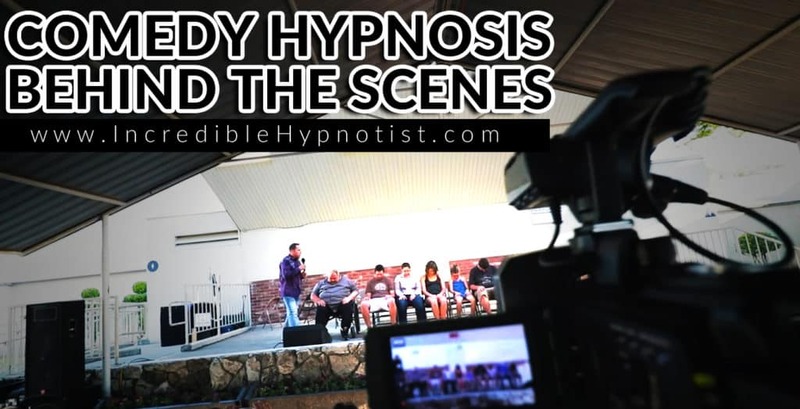 In this video, we showcase the best hypnotic performances captured at the Silver Dollar Fairgrounds in Chico, Florida. Watch this action-packed video to seriously laugh out loud. Want to learn another aspect of stage hypnosis show business? Join the Incredible Hypnotist on his recent New York City media tour in our detailed behind the scenes video. Learn what it takes to be a celebrity hypnotist and the hustle required to spread the word of hypnosis in the media. While it’s fun, it’s not always easy. Want to learn more about Stage Hypnotist Richard Barker? Whether you’re looking to book a seasoned and professional hypnotist or you’re interested in the unique background of the Incredible Hypnotist, you can check out his complete bio. Did you know that Richard Barker started out as a soldier in the British army? Learn more below. How Do I Know I’m Booking a Professional Hypnotist? Here’s a little secret that no one tells you about becoming a hypnotist. Someone can attend a hypnosis training program and become a “professional” stage hypnotist in a matter of a couple of weeks. If you’re looking at a hypnotist’s website to learn more about their comedy show, look deeper than just the title of Stage Hypnotist. Learn more about how to find the perfect stage hypnotist for your event in our special blog: Comedy Stage Hypnosis Show FAQs Answered. Are Comedy Hypnosis Shows Insured by the Booker or the Hypnotist? A stage hypnotist at a fair will carry an Entertainer’s Insurance Policy. The hypnotist’s insurance policy will include general liability and professional liability insurance. Ask the stage hypnotist you’re interviewing to provide you with information on their specific entertainer’s insurance coverage. Don’t hire a stage hypnotist that doesn’t carry an insurance policy for their shows. Read the full answer here: Comedy Stage Hypnosis Show FAQs Answered. Can People in the Audience That Didn’t Volunteer Go into Hypnosis? Even if you decide not to volunteer at a hypnosis show, you could still fall into a hypnotic trance. Richard Barker has seen plenty of audience members, camera operators, producers and sound engineers doze off into a state of relaxation. Anyone that is listening intently to the comedy hypnotist’s induction can be hypnotized. Learn more on our award-winning Hypnosis Blog. This entry was posted in Blogs, Comedy Stage Hypnotist, Fairs and Festivals Hypnosis Shows and tagged Become a Comedy Stage Hypnotist, Behind the Scenes, Clean Hypnosis Show, comedy hypnosis show, Comedy Stage Hypnotist, Hypnosis at Fairgrounds, Stage Hypnotist.